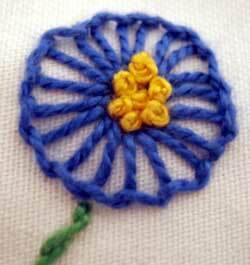 This past summer, I had the pleasure of teaching a group of about 20 children how to embroidery. The girls were aged 9 – 12. 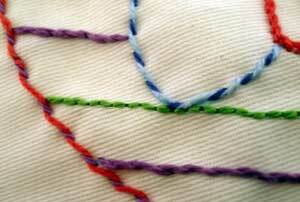 We started with very basic stitches, working on cotton twill, with #5 perle cotton. We used a butterfly cookie-cutter as a design template (50 cents at Wal-mart), along with a ruler and the inner ring of smaller hoops for circles. We used water-soluble transfer pens to draw the designs. We began with the most basic stitch, the running stitch, and progressed to the whipped running stitch, the backstitch, the whipped backstitch, stem stitch, chain stitch, buttonhole stitch, feather stitch, lazy daisy, and French knots. By the end of the summer, the girls were stitching on linen with two strands of DMC, and embroidering bouquets of daisies with stems and bows. I thought I’d share some of their early to mid-way work. They had a lot of fun creating these. The variety in color and the fact that they were stitching things they thought were pretty – butterflies, flowers, hearts, and such – made them extra-enthusiastic. 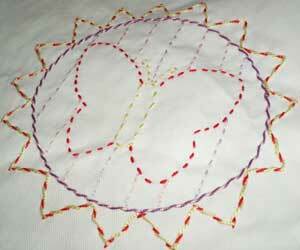 A butterfly within a circle, with multiple lines done in a variety of line stitches. 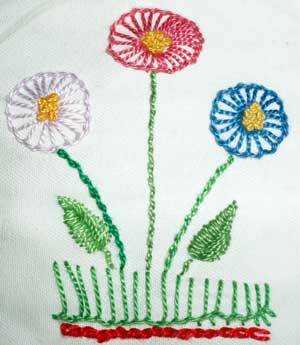 Buttonhole flowers with French knot centers, buttonhole grass, and feather stitch leaves – the stems are stem stitch, and the red line at the base is chain stitch. 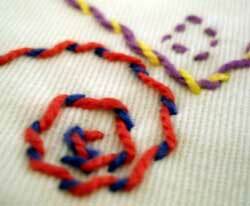 A close-up on various stitches employed: whipped running, stem, and backstitch are featured here. 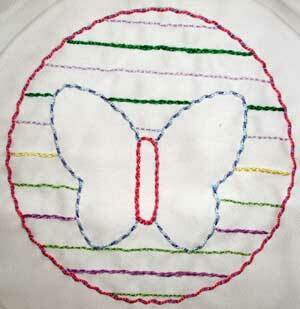 If you start off simple, most children who are interested and enthusiastic can learn simple stitches very quickly. Once they can see progress with simple stitches, they are eager to learn more complex stitches. It takes a little bit of patience to teach young children, but it is really a blast!! If you ever have the opportunity, give it a try! The supplies are few, the rewards great! Thank you so much for your video tutorials, and sharing your vast knowledge of hand embroidery! I homeschool my children, and discover that I tend to school myself first! Your tutorials are easy to understand and fun to watch! 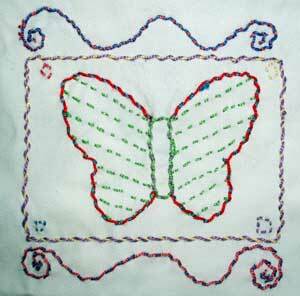 My children will learn embroidery because of your willingness to offer this information freely. Thanks again! Did you have the kids use hoops? Do you recommend a specific size? They used a 5-inch hoop. If you start kids on wool felt, though, you don’t need a hoop. So that might be an alternative, if you want to avoid a hoop.